This article by Peter Olsen-Phillips is re-posted from Open Secrets. Seemingly everyone in Washington favors some kind of overhaul of the nation’s immigration system these days, and proposals are being polished by President Obama, the Senate’s bipartisan “Gang of Eight” and other lawmakers. But outside groups have been vigorously lobbying members of Congress on both sides of the immigration debate for some time. The number of clients lobbying on immigration jumped in 2012, from 317 to 355, OpenSecrets.org data shows. That’s the highest level since 2008. Just as in 2011, the tech industry was the most active on this issue. Out of the top ten organizations filing the most lobbying reports that mentioned the issue, six were tech companies or trade groups. Their big concern has to do with wanting more visas for highly skilled workers in the STEM (science, technology, engineering, and math) fields. While the national unemployment rate remains high, tech companies continually face problems in filling all of their available positions. Microsoft in particular has been one of the industry’s strongest advocates of reform. The company spent some $8 million dollars lobbying in 2012, and filed a total of 33 reports mentioning immigration that year. Other members of the technology sector lobbying on this issue include the Consumer Electronics Association, Intel, Facebook, and Hewlett-Packard. Beyond the tech giants, other organizations lobbying on immigration include NumbersUSA.com, Associated Builders & Contractors, and the National Roofing Contractors Association. NumbersUSA, an organization created explicitly to cut immigration to the U.S., has taken a hard stance against the proposed plans of the White House and the Senate Gang of Eight. In particular, the group faults path-to-citizenship proposals for the 11 million illegal immigrants currently living in the US. CRP data shows that NumbersUSA mentioned immigration in 12 different lobbying reports last year; the group’s $600,000 spent on lobbying last year is a far cry from the millions spent by tech giants like Microsoft or Intel — but then again, it’s a single-issue group. Private prison contractors, such as the Corrections Corporation of America (CCA), and the GEO Group have sometimes made their case in other, more subtle ways, as the Associated Press and NBC Latino report. The private prison industry is responsible for 16% of federal prisoners in the US, and makes a substantial portion of its profits from detention centers for illegal immigrants. Tougher laws would mean higher profits, while a path to citizenship could shrink revenues. 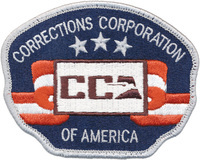 While CCA, for example, claims corporate policy prevents it from lobbying on issues that would “determine the basis for an individual’s incarceration or detention,” OpenSecrets.org data shows the company lobbied explicitly on immigration in 2008 and 2009. And last year, work done for CCA by lobbyists at the firm Akin, Gump, Strauss, Hauer & Feld included “monitor immigration reform,” according to reports filed with the Senate. Other CCA lobbying reports last year indicated the company’s interest in budgets for the Department of Homeland Security and one of the agencies within it, Immigration and Customs Enforcement, with which CCA has contracts to house immigrant detainees. In addition, the firm gave more than $870,000 in campaign contributions in the 2012 election cycle, OpenSecrets.org shows, with most of it going to Republicans. Top recipients of those contributions included Rep. Hal Rogers (R-Ky.) and Sen.Bob Corker (R-Tenn.), both known for having tough stances on immigration. 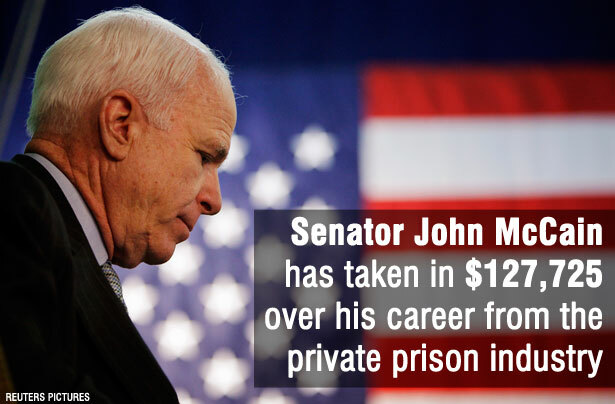 And the data shows Gang of Eight member Sen. John McCain — whose professed views on immigration have fluctuated over the years — is the fourth-highest career recipient of CCA campaign cash.